Every time I finish a book like this, a super twisty thriller (especially one with particularly nasty female characters), I feel the urge to pen one myself. I think "how hard can it be to write a story like this; one with twists and turns and an ending that leaves you wide-eyed" and then I think a little more and decide "probably pretty darn hard". Though it's a testament to Thomas's writing/plot that I would even think such a thing (because I've tried, and it's HARD). While the underlying plot "girl missing/presumed dead" is nothing new I have to say that the execution was pretty spot on and the ending left me going "oh, crap". I think my favorite part of the novel was the mystery itself; not only did we get to see things from Kacey's POV (she's the main character), but we also got to see entries from Bailey's diary (she's the girl that goes missing). We don't get to see much of Bailey before she disappears, so seeing things through her eyes and getting to know her that way is something that felt important because while she's not there she's pretty much the entire story. I'm also pretty sure that I bounced around suspecting just about everyone in the novel at one point or another, but when the reveal came I can pretty honestly say I didn't see it coming, so A+ for that. Granted that's the point of a who-done-it, right? To leave you suspecting everyone, even the main character. The other part of the story I just loved was the characters. There's something about a horrible female character (think more along the woman from Gone Girl, not the stupid petty ones from bad teen rom-coms) that I just love. There's a darkness there that just calls to me, and Thomas nailed that essence perfectly. At its heart, this book is about how horrible teenage girls can be to one another, and it certainly doesn't pull any punches in that aspect. That being said it's possible that for that exact reason some people won't connect with it, but I don't think this book would be what it is without these characters, so I can't find any fault in making it that way. There were a few things I didn't love about the book. The first being the "supernatural" element. Now, I put supernatural in quotes because there is no supernatural element in the book, but while reading it there was that little voice in the back of my mind going "but what if there is!?". I fully understand why it was there, but when it went in that direction I was a little confused because I thought, correctly, that it's a straight contemporary. The other thing I wasn't 100% sold on was the "wrap-up" chapter where everything is explained. The style didn't seem to go with the rest of the book and it seemed like a lot of super important information to stuff into such a short section, but seeing as it's a necessity I can't complain too much, and it did tie up any remaining loose ends. Overall I was really pleased with this book. 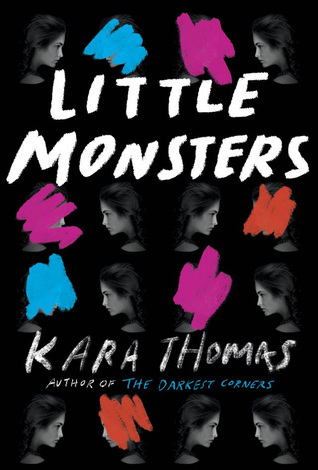 I had read Thomas's first novel The Darkest Corners and while I enjoyed it I wasn't as blown away as I thought I would be so I wasn't sure if I was even going to read this one because of all the things I have to get done, but I took the chance and I'm really happy that I did. It was a fast read that never failed to keep me guessing. I do want to say that while it's comped to Pretty Little Liars I felt it was more Gone Girl than anything (although I've never read PLL and I've only watched a random episode or two of the show), so take from that what you will. Not everyone is going to love this book for one reason or another, but if you're a fan of twisty thrillers and you don't mind rather horrible characters (and I say that with the utmost love because horrible characters in a thriller make it better) I suggest giving it a shot. The one thing I can guarantee is that just like with The Darkest Corners if you make it to the end you'll be left wide-eyed by the last few lines.